The density of Korean, Chinese and imported wheat doughs.Abbreviation: Refer to the Table 1. All measurements are mean±S.D. (n=3). All measurements with the same letter are not significantly different (p<0.05). The pH of Korean, Chinese and imported wheat doughs.Abbreviation: Refer to the Table 1. All measurements are mean±S.D. (n=3). All measurements with the same letter are not significantly different (p<0.05). The dry and wet gluten contents of Korean, Chinese and imported wheat flours.Abbreviation: Refer to the Table 1. All measurements are mean±S.D. (n=3). 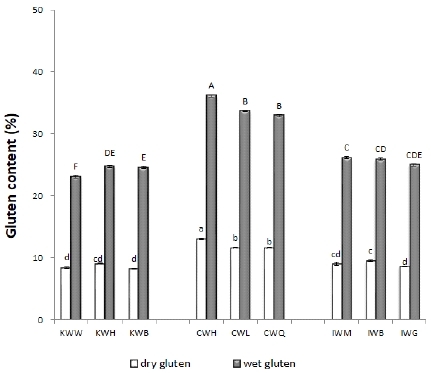 All measurements with the same letter (A∼F: wet gluten, a∼d: dry gluten) are not significantly different (p<0.05). Amylose contents of Korean, Chinese and imported wheat flours.Abbreviation: Refer to the Table 1. All measurements are mean±S.D. (n=3). All measurements with the same letter are not significantly different (p<0.05). β-Glucan contents of Korean, Chinese and imported wheat flours.Abbreviation: Refer to the Table 1. All measurements are mean±S.D. (n=3). All measurements with the same letter are not significantly different (p<0.05). AACC, (1987), Approved Methods of AACC, 9th ed., Method 38-12, American Association of Cereal Chemists, St. Paul, Minnesota, USA. AACC, (2000), Approved Method of AACC, 10th ed., Method 46-12, American Association of Cereal Chemists, St. Paul, Minnesota, USA. An, HL, Lee, KS, (2009), Study on the quality characteristics of pan bread with sourdough starters from added domestic wheat flours, J East Asian Soc Dietary Life, 19(6), p996-1008. AOAC, (1980), Official Methods of Analysis, 15th ed., Association of Official Analytical Chemists, Washington, DC, USA, p31. Browder, IW, Wiliams, D, Sherwood, E, McNamee, R, Jones, E, DiLuzio, N, (1987), Synergistic effect of nonspecific immunostimulation and antibiotics in experimental peritonitis, Surgery, 102(2), p206-214. 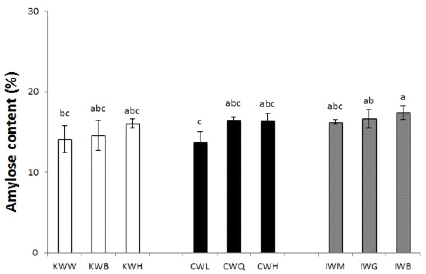 Choe, M, Kim, HS, (2002), Effects of Korean wheat on LDL oxidation and atherosclerosis in cholesterol-fed rabbits, J Korean Soc Food Sci Nutr, 31(1), p104-108. Choe, M, Park, JB, Kim, HS, (2000), Screening of immuneenhancing substance(s) from Korean wheats, J Korean Soc Food Sci Nutr, 29(2), p307-311. Choi, SH, Lee, SJ, (2014), Quality characteristics of Korean wheat bread prepared with substitutions of naturally fermented rice starters, Korean J Culinary Res, 20(4), p100-119. Chung, HJ, Park, HJ, (2014), Influence of the addition of aronia powder on quality and antioxidant activity of muffins, Korean J Food Preserv, 21(5), p668-675. Czuchajowska, Z, Paszczyñska, B, (1996), Is wet gluten good for baking?, Cereal Chem, 73(4), p483-489. DiLuzio, NR, (1983), Immunopharmacology of glucan: A broad spectrum enhancer of host defense mechanisms, Trends Pharmacol Sci, 4, p344-347. Franek, J, Malina, J, Krarka, H, (1992), Bacterial infection modulated by glucan: A search for the host defense potentiation mechanisms, Folia Microbiol (Praha), 37(2), p146-152. Jang, HR, Park, JS, Shin, S, Shin, GM, (2008), Properties of white pan breads made with Korean and imported wheat flours, Korean J Food Preserv, 15(6), p884-890. Juliano, BO, (1971), A simplified assay for milled-rice amylose, Cereal Sci Today, 16, p334-340. Kang, CS, Kim, HS, Cheong, YK, Kim, JG, Park, KH, Park, CS, (2008), Flour characteristics and end-use quality of commercial flour produced from Korean wheat and imported wheat, Korean J Food Preserv, 15(5), p687-693. 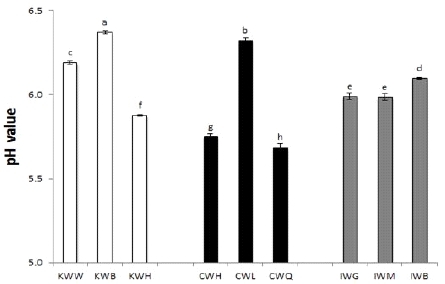 Kang, CS, Kim, KH, Park, JC, Kim, KH, Park, KG, Cheong, YK, Yoon, SJ, Park, CS, (2011), Relationship between polyphenol oxidase activity and color of white salted noodles prepared from Korean wheat cultivar, Korean J Breed Sci, 43(4), p470-478. KATI, (2018), KATI Import and export statistics, http://www.kati.net/statistics/regionalPerformanceByNation.do Accessed July 23, 2018. Kim, HY, Oh, MS, (2001), Comparisons of bread making properties using domestic and imported flour and quality change during storage, Korean J Dietary Culture, 16(1), p27-32. 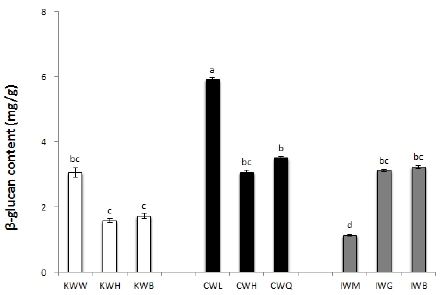 Kim, KT, Chio, AR, Lee, KK, Joung, YM, Lee, KY, (2007), Quality characteristics of bread made from domestic Korean wheat flour containing cactus chounnyuncho (Opuntia humifusa) powder, Korean J Food Cookery Sci, 23(4), p461-468. Kim, ML, (2005), Sensory characteristics of Korean wheat flour noodles with pine pollen and antioxidant activities of pine pollen extracts, Korean J Food Cookery Sci, 21(5), p717-724. Kim, SK, Kim, BN, (1989), Survey on wheat flour utilization in Korea, Korean J Dietary Culture, 4(1), p109-120. Koh, WB, Noh, WS, (1997), Effect of sugar particle size and level on cookies spread, J East Asian Soc Dietary Life, 7(2), p159-165. Lee, KH, (1996), Sensory characteristics of pound cake baked from Korea wheat flour, Korean J Food Nutr, 9(4), p419-423. Lee, SY, Hur, HS, Song, JC, Park, NK, Chung, WK, Nam, JH, Chang, HG, (1997), Comparison of noodle related characteristics of domestic and imported wheat, Korean J Food Sci Tech, 29(1), p44-50. Magoffin, CD, Hoseney, RC, (1978), A review of fermentation, Baker’s Digest, 48, p22-29. Ministry of Agriculture and Forestry, (2007), Agricultural and Forestry Statistical Yearbook, Seoul, Korea, p258-283. Reynolds, JA, Kastello, MD, Harrington, DG, Crabbs, CL, Peters, CJ, Jemski, JV, Scott, GH, DiLuzio, NR, (1980), Glucan-induced enhancement of host resistance to selected infectious diseases, Infection Immunity, 30(1), p51-57. 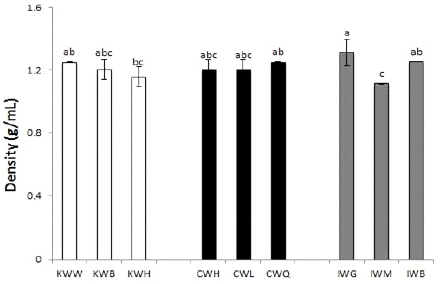 Shin, SH, Kang, CS, Kim, KH, Park, CS, (2012), Analysis of glutenin compositions in Korean wheat cultivar using SDSPAGE and PCR, Korean J Breed Sci, 44(3), p245-257. Song, CS, (2013), Characteristics of dinner roll added with lyophilized sweet potato and its functional property, MS Thesis Hansung University, Seoul, Korea, p14. Song, JC, Lee, SY, Park, NK, Hur, HS, Nam, JH, (1998), Comparison of flour quality between domestic and imported wheat flour, Korean J Breed, 30(2), p156-161.